We’ve put a list together for you , to help you get the must have, top accessories that every fireplace should have. The only way to handle logs in your fireplace, fireplace tongs are a must for every fireplace. With Tongs, you won’t get burnt or splinters anymore. There are a variety of styles of tongs available, but we recommend going for the scissor action style grip, which gives you full control of the awkwardly shaped logs or coal that you need to handle. No more splinter and blisters please! Of course, every fireplace needs logs of wood to make a nice and warm fire, so you need somewhere to store the logs. There’s no better way to store them than using a Log Handler. They keep the wood off the ground, to keep away the damp. There are various sizes and styles to a suite for indoor and outdoor areas. We’ve picked out some that we like that compliment the pleasant hearth fireplace doors. These Hearth Collection log racks from Panacea provide a perfect place to store and also dry the firewood you’re cut to size for your fireplace. These racks are are created thick tubing with powder coating to be durable. It’s great to place next to your fireplace and it can also be placed outdoors if you don’t have the space for it indoors. If you require a bigger log storage area, we recommend going for a Landmann Firewood Log rack. It measures 8 foot long, so there’s plenty of space to stack-up the logs for those long winters. 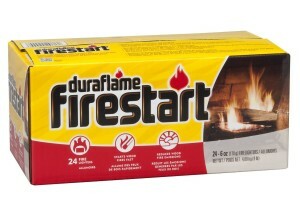 If you’re always struggling to start a fire, we think it’s time make life easier by getting some fire starters. They’re fairly cheap to buy, and it just makes it simple to start the fire within seconds. No more frustrating efforts to get warm again!